What's your favorite TV comedy right now? The polls are open! TV Guide Magazine is turning the power over to the readers, inviting them to cast their vote for which shows they would like to see featured on the cover. The competition is heating up, and by logging onto TV Guide Magazine's Facebook page, fans can vote as many times as they would like help their favorite show come out ahead. Vote now for your favorite comedy, and come back every day this week to check for new categories (2 new ones revealed each day). The winners of the 4th annual Fan Favorite Poll will be revealed on the cover of TV Guide Magazine's April 22-29 double issue, available on newsstands April 25. The polls close on Monday, March 11 at noon ET. Fans can help their favorite show land on the cover of TV's #1 publication by logging onto Facebook, "Liking" TV Guide Magazine, and voting for their favorite show! Selected by TV Guide Magazine's Editors, the 2012 Fan Favorite nominees in the "Favorite Comedy" category are 2 Broke Girls, Community, Cougar Town, Girls, Glee, Happy Endings, Modern Family, New Girl, The Big Bang Theory, and The Middle. Who will you choose? You can make a difference. The SitcomsOnline pick for Favorite Comedy goes to Modern Family (though 2-3 others are tempting, too). Go and vote and your favorite comedy could make the cover! Fox's Tuesday sitcom starring Martha Plimpton airs Tuesday nights at 8:00pm & 8:30pm and we have just watched the episode that airs tonight (Feb. 26) at 8:30pm. Hilary Duff guest stars! In the episode airing tonight, "The Old Girl," Sabrina (Shannon Woodward) is excited to introduce her new friend, Rachel (guest star Hilary Duff), to the family, but Virginia (Martha Plimpton) and Burt (Garret Dillahunt) are shocked when she turns out to be Jimmy's (Lucas Neff) ex-girlfriend who broke his heart as a teenager. After Hope is bitten by a cow at the Natesville petting zoo, they receive 500 pounds of beef in order to avoid a messy lawsuit. The family has nothing but meat for the next week. Sabrina shows them a photo of her new friend, Rachel. Everybody is shocked to see that she is Jimmy's ex-girlfriend. Jimmy had met her at college when he was 18. They meet every single weekend, but the relationship is eventually ended by Rachel. Jimmy, Virginia and Burt later sing Ain't No Sunshine in a breakup video montage. Sabrina invites Rachel over for dinner. Jimmy reads a letter that he had written to Rachel seven years ago. Rachel tells him that Virginia and Burt are the whole reason they broke up. In flashback scenes, a young Jimmy is shown by rejected by a girl at a grocery store. Young Jimmy also sings Ain't No Sunshine. Many years later and in more flashback scenes, Virginia and Burt go to the college to meet Rachel. They don't want to see Jimmy get his heart broken again, so they try to get Richard interested in Rachel. Richard, however, has his sights set on somebody else. Will Rachel stay for the dinner or will she go? Tune in to find out. 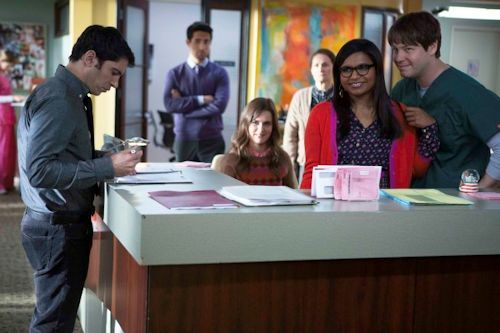 Fox's Tuesday night comedy starring Mindy Kaling airs Tuesday nights at 9:30pm immediately following New Girl and we have just watched the next episode that airs tonight (Feb. 26). Seth Rogen guest stars!. 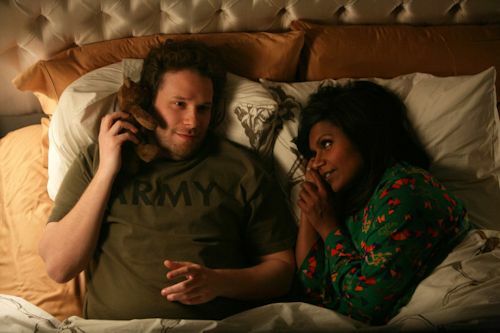 In the episode airing tonight, "The One That Got Away," Mindy (Mindy Kaling) reunites with her "first kiss," Sam (guest star Seth Rogen) and the two reminisce about their time at Jewish summer camp, and soon rekindle the sparks of their teen romance. Mindy has reunited with an old flame once again (surprise?) when she meets up with Sam (played by guest star Seth Rogen). Unlike many of her old flames, though, Sam goes pretty far back... all the way back to when Mindy was at Jewish summer camp (don't ask). It was at this summer camp where Mindy first met Sam and had her first kiss. Of course, once summer was over, she was headed back home and Sam was out of her life. That is, until Sam returns home from his duty in the Army (wearing an Army t-shirt that Mindy is convinced that he picked up at hipster-chic Urban Outfitters) and meets up with Mindy. Once she finds out that Sam is about to be deployed again, she becomes a bit reluctant to attempt to rekindle the relationship, but as she begins to fall for him once again, she considers doing whatever it takes to keep him from leaving her life... literally anything.